The ball design means these headphones feel like holding a pair of Maltesers but the pay-off is that they're very rugged - there's no signs of stress when you squeeze them. The buds are lightweight and actually sit well in the ear - they're small enough not to protrude, meaning they aren't going to fall out easily. The cable features a sizable silver remote which, while eye-catching, works brilliantly thanks to the chunky, easy buttons. The ball design comes with several earbuds, designed for various ear sizes - get the right one and you'll be happy. 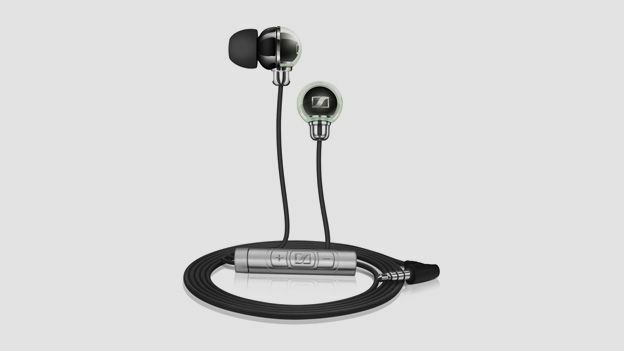 The earbuds themselves are black rubber, which are soft and lightweight. They don't offer the complete seal of sponge or fabric-based buds but the comfort is worthwhile and the design ultimately means you get more of the sound without any muffled bass. The cable is standard headphone quality but the headphones themselves are rock solid and the inline remote is strong too. The dinky rigid carry case is harder than necessary - a soft wallet would suffice - but there's no doubt the CX 890is are designed for tough work and play scenarios. In terms of rivals, only dedicated 'rugged' headphones can beat the CX 890is - like the Klipsch S4i Rugged headphones. Sennheiser always make balance headphones and these are no different. There's bass when needed but it doesn't smother everything - detail and a wide soundstage make for a great stereo sound. Playing Milkshake by Kelis, the CX 890is party hard and soft, acoustic Alanis Morissette tracks reveal all the sonic detail if you're prepared to turn them up. There's little leakage so you can feel happy doing that on the bus too - we played Foo Fighters and the CX 890is definitely showed a talent with rock that few rivals can match for the money. If pop and rock are your main interest, these headphones are great all-rounders. Tough, balanced and eye-catching, the CX 890is are a worthwhile investment that can be used at home or on-the-go with no drop in sound quality or annoying noise leakage. They're expensive but great value and ideal for anyone who listens to much of their music collection on-the-go.